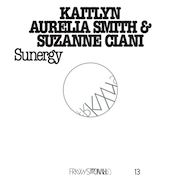 The main feature of Sunergy (53'57"), the collaboration between Kaitlyn Aurelia Smith & Suzanne Ciani, is its proximity to electricity. After just a few minor transitions, the current that pours out of a common wall socket is sent out upon the air as sound. A duo uniquely suited for this task, Smith and Ciani both hear the melody of engineering, and the harmony of technology. Perceiving how their music systems works, as a whole, as an entity, in deep jam sessions they drop back into their music, like it is their own place. As serene as they appear in this activity, some smoke may be detected rising above their heads - the smoldering yield from happily firing synapses; as the three tracks on Sunergy perfectly capture the transportive pleasure of a creative pursuit. Exhibiting improvisational confidence and control these players listen to and follow each other through delicately shaded studies of expanding and contracting planes of sound. Ever adjusted modulated timbres provide motion and expression throughout a fluctuating field. Charged with vagueness, oscillators become blocks of sound, and repeating patterns of notes provide a constant stimulus to the imagination. Growing like an organism, sets of notes steadily repeat while others rush and flourish, and the mind of the listener stretches to every dimension this work occupies. Sustaining tones writhe beneath sweeping processes in a suggestion of synthetic refinement. In reciprocating imagined zones, a saturating electric dust evokes the delight of abstraction. Yet, with its consonant tone and winsome nature, this work is simply very easy to listen to - gently opening up the mind to new insights. Both Smith and Ciani believe that their electrical devices were meant to be performed on in real time, realizing singular musical works out of such sessions. They follow a play of emotional expression that cannot with any completeness or exactitude be defined. But, of more significance than what they are doing with their instruments is whatever it is they are triggering in our minds. In our modern digital age, we find Electronic Music has emerged as the most unrestricted genre in the history of music. It is the music of ideas - and electronic instruments are machines perfectly suited to make their users think. Its possibilities are far broader than was ever imagined. Lesser music asks you to think big, then gives you nothing big to think about. With these textured, imagined sonic worlds, we try to find how close music may bring us to the truth, and the feel and force of life. 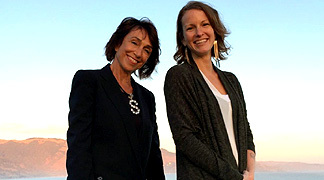 With Sunergy, Smith and Ciani attempt to find out, and the world is undeniably richer for their work.